Theater is one of the oldest forms of performing art. From the stone ages, men and women have been telling stories by enacting them when even no language existed. 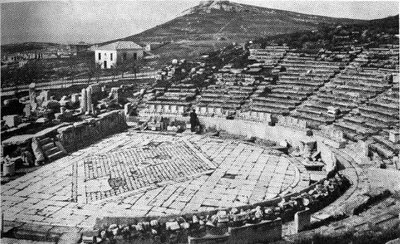 Ancient Greek theater still inspires us and they continue to be staged in all languages of the world. The ancient Hindu scriptures regard the text of the theory of performing arts (Natya Shashtra) as the fifth Veda (Pancham Veda). And just like the Greek theater, ancient Indian Sanskrit theater were also highly developed. It is not that nobody goes to the theater these days. In 2005 12.5 million people visited Broadway shows in New York and around 8.5 million people went to off Broadway theater. For good quality regional theaters too, you’ll find it difficult to get a ticket if you do not purchase them in advance. But the most neglected theater in USA is the community theater. They are hard pressed to get a good audience. They have to depend on those minuscule grants and donations from various sponsors. Ethnic theater groups (like ours) who do theater in their regional languages, even have a limited audience. We often have to face the challenge – how can we fill our theaters with our own audience? The problem is that most of the plays we produce fail to connect with the people around us. They don’t feel that electrifying experience when they watch the revivals or old classics of Bengali theater. The only value is the nostalgia that these plays invoke within us, nothing else. The second issue is that, these productions do not have the star power to pull in the audience. Some groups have tried to bring in actors and directors from India in order to attract the audience, but that cannot be a solution. And finally, of course, is the lack of production funds that is required to rent a theater space, to create a gorgeous stage and to market the show in popular media like television. To bring in the audience, the first condition is that we need to let the people know about the event. Inexpensive marketing methods like online marketing, some print media, fliers and posters can only reach a limited number of people. However,I think that to bring in the audience in this country, the first thing we need to do is to develop our own theater that can connect easily with our people. We need to develop and produce plays that can reflect our own lives on stage, and only then will our people be interested in coming to watch their own plays. We (Ethnomedia Center for Theater Arts) have been trying to do this for some time now and have been partially successful. ENAD, another theater group in the Bay Area have also adopted the same philosophy. But we have a long way to go. But I guess we need to start somewhere. Secondly, I think we need to establish a steady database of theater lovers who would like to watch our plays and then finding out the best means to reach out to them (email, snail mail whatever.) Creating a subscriber base is a standard practice of many community theaters, but since we do not have a regular schedule of shows planned well ahead, it is difficult for the audience members to plan their schedule around it. And finally, it is the audience who should feel the urge to go to the theater. If a person does not feel excited about going to the theater, about experiencing the way life is enacted live in front of them, about listening to and experiencing the stories of ourselves, then nothing can work. Theater is like a mirror where we can see ourselves, but we need to muster up the courage to face it and to enjoy it whole heartedly. How can 12.5 billion people go to Broadway a year when there are only 6 billion people in the world? Sorry – it should have been millions. I stand corrected. I would not call movies as fake. Movies are perform once, and watch over and over again by many many people. Theatre is watched only by the live audience, unless it is videotaped. Movies give you a much much bigger canvas. You can shoot at different locales, but in theatre you are retricted to the stage. The advantage of theatre is the possibility of a live discussion by the actors with the audience, after the show, which unfortunately very few theatre companies do. Hence theatre is an excellent medium for controversial topics. Another advanage of theatre is low-cost of production, but with today’s digital cameras, movie production costs have dropped drastically. I sometimes want to go to the theatre to be surprised. Movies, because of their ease of availabilty, can have too much hype around them, which could bias me towards the movie even before I see it. And theatre gives voice to the small budget man, who not necessarily has small ideas to present. Because of live actors, theatre is expected to be more cohesive. Movies are shot over days or weeks or years, and directors like Woody Allen do not even give the script to the actors. They just ask the actor to say a dialogue in a happy/sad/angry/etc. tone. So if the director/editor screw up, the actors won’t even know about it till it is too late. Also, because of interspersed shooting schedules, in movie, it could be very difficult to get the exact emotion out of the actors, specially if the actor is working on multiple movies at a time. Hence usually, good actors come out of the theatre. Also, many famous actors return to theatre just to do some “real” acting.